Suwarna to Know About Naira Will warn Her to Stay Away from Kartik Yeh Rishta Kya Kahlata Hai Spoiler. Suwarna to Know About Naira Warns her to Stay Away from Kartik. 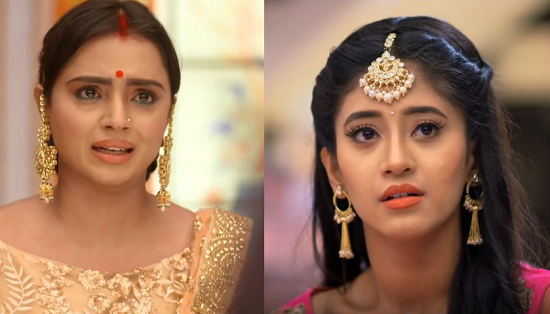 Star plus Popular Serial Yeh Rishta Kya Kahlata Hai is Getting Interested Day By Day with its New Storyline Revolved Around Naira (Shivangi Joshi ) and Kartik (Mohsin Khan). We have Seen in the Latest Episode How Naira and Kartik Joined Hands for Keerti and Naksh’s Anniversary Party and on another side, Goenka and Singhania Joined Hands for Naira-Kartik as they already come to Mumbai. Naira and Kartik will arrange a party for keesh’s anniversary as they don't want them to suffer because of their differences. We have Seen How Manish Unable to Talk to Suwarna who will take Enter during Celebration and will get Shocked to see Naira and Kartik together working and that too with Singhania and Goenka family. Naira will be hurt seeing Suwarna's hatred and is irked, stay tuned for more updates, Spoilers, Tv Segment Written Updates, Gossips on Yeh Rishta Kya Kahlata Hai.